The tricky shape of this bedroom, and the movement of the building over the years made these wardrobes an interesting challenge, but also brought about one of our most popular house styles. The oak frame around the cabinet doors give the cabinets a pleasing symmetry and definition even when the space they are fitted into is very irregular as is often the case with older London properties. 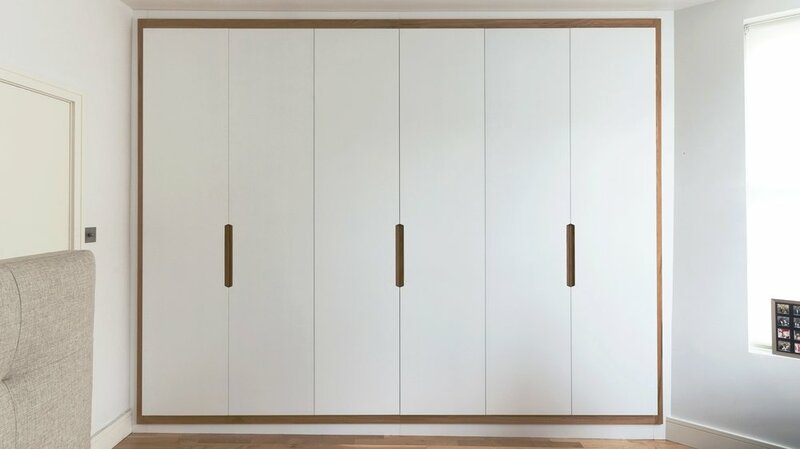 The wardrobe interiors are constructed from white melamine faced MDF with a 2mm thick solid oak edge. The doors are spray lacquered MDF with custom routed finger pulls with solid oak back ups. The internal configuration of wardrobes like these is entirely flexible, with multiple options on materials, drawers and hanging space.